What is the Freeway Service Patrol? The Freeway Service Patrol is a proven traffic congestion relief program that saves motorists time and money. It provides free emergency roadside service to motorists, keeps the freeways clear and prevents traffic from backing up and causing longer commute times, especially during peak rush hours. Less time on the road also means everyone saves on fuel costs and reduced emissions. It has been successfully implemented in many urban areas across the country such as Los Angeles, San Francisco, San Diego, Orange County, Las Vegas, Chicago, Florida, Maryland, New York, and many others. Studies show bottlenecks from stopped vehicles create a chain reaction, and can cause "secondary accidents" which create more traffic congestion and delays. Clearing the freeways keeps Hawai'i moving and everyone safe. What is the role of the Freeway Service Patrol in Hawai`i? The Freeway Service Patrol program is operated by the State of Hawai`i Department of Transportation in collaboration with the City and County of Honolulu's Police, Fire, Emergency Medical Services and the Department of Transportation Services. 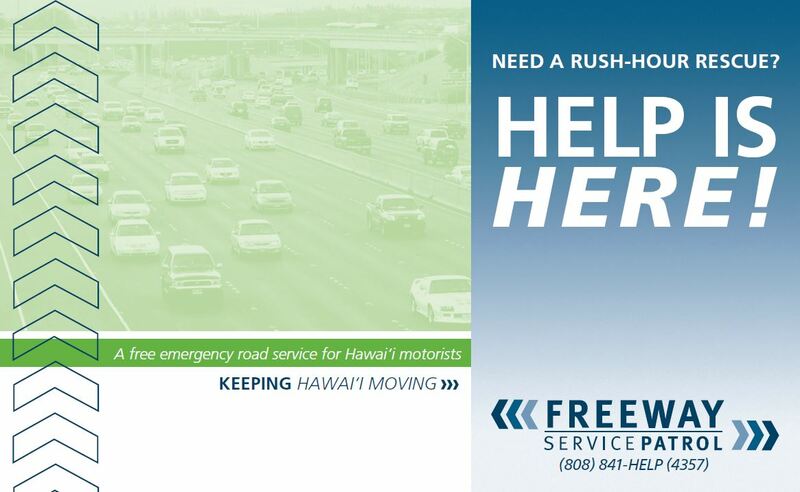 The Freeway Service Patrol provides free emergency roadside assistance to motorists who are stranded on the H-1, H-2 and the H-201 (Moanalua) freeways and assists HPD at crash scenes by providing traffic control assistance. These services help keep freeways clear, preventing traffic backups and reducing the risk of secondary crashes caused by traffic congestion. Less time on the road also means savings on fuel costs and reduced emissions. When did the program begin in Hawai`i? On June 17, 2009, the Freeway Service Patrol Program was launched in Hawai’i. What are the Freeway Service Patrol hours of operation? The Freeway Service Patrol services are available Monday through Friday from 5:00 a.m. to 7:00 p.m., except for holidays observed by the State of Hawai`i. 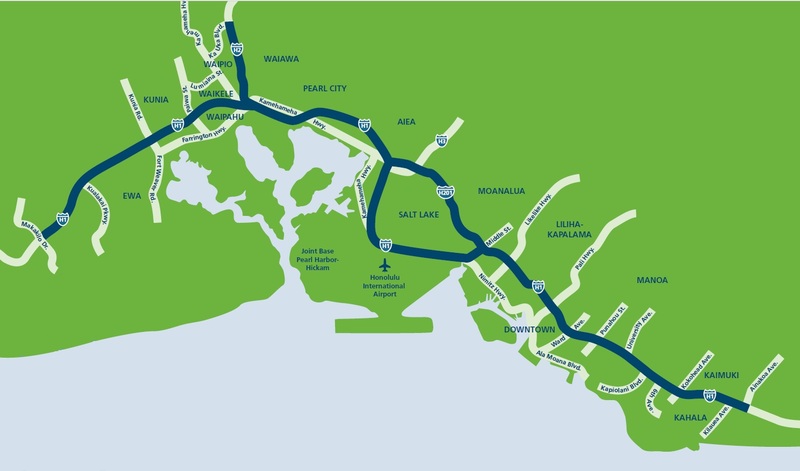 On which section of Oahu’s freeways is the service provided? The Freeway Service Patrol covers approximately 29 miles of freeway in both directions, including a 22 mile stretch along the H-1 freeway from Kunia Road to Ainakoa Avenue, a 4.8-mile stretch along the H-201 (Moanalua) freeway, and 2.1 miles of the H-2 freeway from the H-1/H-2 interchange to Ka Uka Boulevard. Why were these sections of freeways selected? These sections were selected because they are areas with the highest traffic volumes and the greatest potential for stalled vehicles and/or incidents which would have an adverse impact on traffic congestion. Whom do I call when I need these services? To take advantage of these free services, call (808) 841-HELP (4357) to contact the Freeway Service Patrol between the hours of 5:00 a.m. and 7:00 p.m., Monday through Friday, except for holidays observed by the State of Hawai`i. Watch for the Freeway Service Patrol name and the Hawai`i Department of Transportation seal on the tow trucks that will operate on the H-1, H-2 and H-201 (Moanalua) freeways. The Freeway Service Patrol program works closely with the Honolulu Police Department. The Honolulu Police Department will respond to 911 distress calls when the Freeway Service Patrol is off-duty (see operating hours) or in locations outside of the service areas. What types of services does the Freeway Service Patrol offer? What can I expect to receive from the Freeway Service Patrol? Freeway Service Patrol operators gladly assist in attempting to get a vehicle started and back on the road. The objective is to increase safety for stranded motorists while allowing vehicles to continue to move. Once the vehicle is off the freeway, motorists can utilize a private tow service, insurance company or other form of assistance. Does FSP tow all types of vehicles? No, the Freeway Service Patrol is not equipped to tow heavy vehicles. Also, if vehicles are involved in a motor vehicle collision, they may not be towed unless directed by the Honolulu Police Department. In addition to being able to tow, all FSP trucks are equipped with push bumpers and Operators are trained to assist motorists in pushing their vehicle off the road if they are located in a travel lane. Additional options are available for pulling vehicles to the side of the freeway, out of the lanes of traffic. If there is traffic congestion, how will Freeway Service Patrol get to my vehicle in a timely manner? Motorists should call (808)841-HELP(4357) and know that Freeway Service Patrol trucks are already patrolling the freeway, so they will already be on the road and searching for stalled vehicles to help. In addition, all Freeway Service Patrol vehicles are monitored by a global positioning system (GPS) to monitor where they are located and how they can best be utilized or dispatched to motorists who need assistance. Motorists are encouraged to call the Honolulu Police Department utilizing the 911 system if they need assistance outside the Freeway Service Patrol hours of operation or service location. How does the GPS System Work? The Hawai`i State Department of Transportation uses advanced technology to monitor the location and direction of the Freeway Service Patrol trucks that patrol the freeways. Using a GPS location device called Geotab the Hawaii Department of Transportation is able to monitor each Freeway Service Patrol truck embedded with a GPS device. The locations and movements of the trucks in the fleet can be seen in real time. What is the role of the Honolulu Police Department in this program? The City & County of Honolulu's Police, Fire, Emergency Medical Services and the Department of Transportation Services, have been key in developing the program's operational procedures. The Honolulu Police Department plays a critical role in the process and developed procedures so that the Freeway Service Patrol will be contacted in the event of motor vehicle. The Honolulu Police Department responds to calls for assistance via the 911 system that are outside of the Freeway Service Patrol service area or hours of operation. When appropriate,the 911 system will also dispatch the Honolulu Fire Department or Emergency Medical Services. What special kind of equipment for towing is in service? The trucks were specifically built for the Freeway Service Patrol in Hawai`i and each tow truck costs about $95,000 to build and equip. The Freeway Service Patrol fleet of vehicles consists of 10 medium size tow trucks, with push bumpers, and other special features on them. Do FSP trucks have special equipment that help traffic congestion when there are stalled vehicles? Yes, these trucks are specially designed to remove stalled vehicles from the road quickly. In addition to a traditional tow truck, the 10 tow trucks are equipped with push bumpers, low-profile wheel lifts, and have motorcycle towing capabilities, which allow the Operators to quickly and efficiently tow vehicles when necessary. If towing or pushing a vehicle is not possible, each truck is equipped with straps that can pull vehicles out of the traffic lanes in order to move motorists to a safe location and keep traffic moving. What type of training is provided to the FSP operators? All Freeway Service Patrol Operators must take and complete an extensive training program that consists of classroom training, in-the-field hands on instruction, and then must pass a program proficiency test. Since the Freeway Service Patrol may often be on the scene, Operators receive extensive training on the mechanics of tow and dispatch operations, vehicle inspection and maintenance, and basic car repair. All Freeway Patrol Service Operators have been trained in basic first-aid and CPR. They have also received specialized training in fire extinguisher and recognizing hazardous materials. The training also includes incident management response, safety precautions, and customer service. Last but not least, all operators must pass substance abuse training, screening and are subject to random testing. How much does this program cost to implement? The program costs about $3 million annually with $2.7 million coming from the Federal Government and the remaining $300,000 from the Hawai`i State Department of Transportation. The trucks were built specifically for the Freeway Service Patrol in Hawai`i and each tow truck costs about $95,000 to build and equip. While this may seem like a lot, studies show that for every tax dollar spent on the Freeway Service Patrol services, the public can realize a benefit-to-cost ratio of many times above the amount spent to fund the program. A recent study by the Hawai`i State Department of Transportation calculated the average benefit-cost for the first two years of FSP service at just under 8:1. This means that for every dollar spent, motorists received about $8 in benefits. These benefits are measured in terms of reduction in delay, vehicle-hours, savings in fuel, and decreases in emissions. These ratios do not factor in the benefits associated with air quality improvement or collision reduction. Should the Operators be given a tip? No. Freeway Service Patrol Operators are not allowed to accept tips or gratuities of any type. Are there plans to expand to other sections of Oahu’s freeways? Already, the program has been extended three times. Today, the Freeway Service Patrol covers approximately 29 miles of freeway in both directions, including a 22 mile stretch along the H-1 Freeway from Kunia Road to Ainakoa Avenue, a 4.8-mile stretch along the H-201 (Moanalua) Freeway, and 2.1 miles of the H-2 Freeway from the H-1/H-2 interchange to Ka Uka Boulevard. What is the best advice for motorists who do not want to experience a vehicle breakdown in the first place? Motorists can help prevent their vehicles from having a breakdown on the freeway by taking some precautions and through regular maintenance. How can I contact Freeway Service Patrol?